Fujifilm has added a u2018premium compactu2019 to its autumn 2011 line-up, in the shape of the X10. Fujifilm has added a ?premium compact? to its autumn 2011 line-up, in the shape of the X10. Equipped with a newly developed 12-million-pixel (2/3?-type) EXR-CMOS imaging sensor and a built-in optical viewfinder the X10 is styled on the ?look and feel? 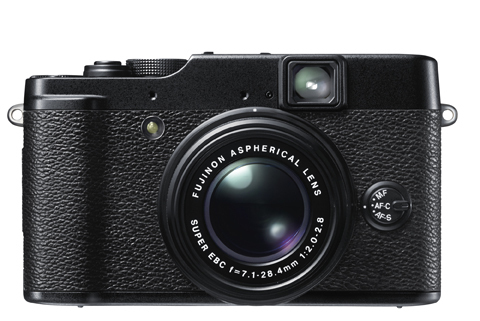 of Fuji?s flagship X100 model released earlier this year. Features include an f/2 Fujinon lens, designed to deliver the 35mm viewing angle equivalent of a 28-112mm zoom and claimed to focus down to 1cm. The lens consists of 11 elements in nine groups and includes three aspherical glass elements. Fuji claims that seven frames per second shooting is possible at full resolution, thanks to the camera?s ?high-speed? EXR processor. Encased in a die-cast magnesium alloy body, on board firepower also includes a 2.8in (460,000 dot resolution) screen, 49-point contrast AF system, full HD video and a claimed shutter release time lag of 0.01secs. Fujfilm tells us that the ISO range for full resolution images is 100-5000 and the camera includes an electronic horizon level gauge. A top panel-mounted dial, enabling exposure compensation of plus or minus 2EV in 1/3EV steps, contributes to the camera?s ?elegant design?. Meanwhile, creative options include Film Simulation modes such as Velvia, Provia and Astia, as well as monochrome. There are also nine white balance preset options, while Highlight Tone and Shadow Tone can be used to adjust contrast in highlight or shadow elements of an image. Noise reduction can be set at five different levels and 360 degree panoramic photography is possible, as is raw format shooting and in-camera raw processing. Fuji claims that the X10?s pop-up flash has a range of seven metres. However, the X10 will also be compatible with Fuji?s current EF-20 and EF-42 flash units. The X10 is due out at the end of October at a price yet to be announced. Optional accessories will include a ?retro?-style leather case.